The Master of Science in Innovation and Business (MSIB) is a 15-month, part-time multidisciplinary and integrative graduate degree program that gives young professionals in the STEAM (science, technology, engineering, agriculture, architecture, mathematics, and medicine) fields the skills to realize the next wave of innovation. The course teaches technically-inclined students the fundamental business, design, and leadership skills via team-based innovation projects. In the end of the program, MSIB graduates will be able to design and manage innovation in a start-up or a corporate setting. A number of MSIB alumni and students were able to get level 1 and level 2 Global Innovation Management Institute (GIMI) certification. The personality, ambition and traits of the student as an innovator. The ability to spot an opportunity and its market. The product or service and its value proposition. The business elements (business model, plan and structure) that are necessary to seize the identified opportunity thanks to the innovative product or service in a systematic and sustainable way. Provides students with an opportunity to showcase their product or service (or related prototype) and pitch orally for their business idea. Relevant stakeholders, prospective customers, partners and venture capitalists are invited to discover and evaluate. Demand for STEAM employees is structurally lower than supply in the Philippines. Career progression of STEAM employees plateaus if they stay in technical positions. Economic environment is more open, dynamic and structurally forces companies to disruptively innovate to remain competitive. The Philippines enjoys consistent economic and demographic growth and is poised to be a major world economy (12th) in few years. The country shares many characteristics, risks and opportunities, of the emerging economies and makes Manila a good place to learn to innovate to tap the opportunities of those structurally untapped markets. AIM is well connected with the business community, being strategically located in Metro Manila and has a significant alumni network globally. Am I qualified to take up a Master of Science in Innovation and Business? Proficiency in oral and written English (IELTS Band 6 for candidates from non-English speaking countries). In addition to the above listed qualifications, AIM seeks among applicants a) passion for business and innovation and b) the ambition to build new customer-centered technology products for business and society as entrepreneurs or innovators in established companies. 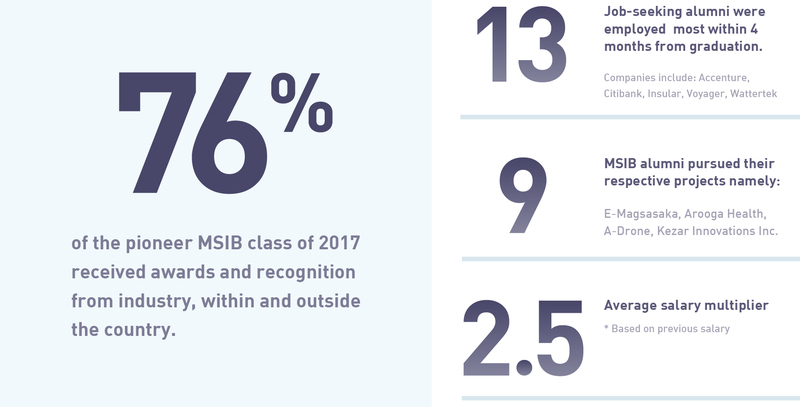 The MsIB program occasionally welcomes applications of of non-STEAM graduate as as long as they are nurturing projects at the junction of science and technology, innovation and who have the drive to pursue them! The past MSIB batches have accepted non-STEAM graduates into the program. Non-STEAM graduates, must specify in their requirements (especially the video essay), why they should be considered for the program and what ideas they would like to work on while they’re in the program. Just like any other applicant, the final decision to offer admission into the MSIB program relies on the faculty interviewing the applicant. MSIB is a part-time degree program, allowing students to work and study at the same time. Students will be required to attend a 2-week intensive classes to start the program. Following this, classes will be held on Friday evenings and Saturday whole day. Classes will include time for field work, seminars, innovation overture, competitions, innovation tours, networking, mentoring and Demo Day. Does MSIB require students to submit a thesis to complete the program? Yes, like any other AIM student. It is called a ‘Capstone Project’. The MSIB capstone project is a 6-unit application oriented course designed as the integrating and culminating activity for the Master of Science in Innovation and Business (MSIB) program. It is meant to provide the students with an opportunity to employ the approaches, frameworks, methodologies, and other skills learned from the program and apply these in a comprehensive manner to their respective projects. What do I need to submit to apply for the MSIB program? Kindly refer to the How to Apply page. What are the program fees, payment terms and related costs? The program fee for the MSIB program is USD 19,500. The registration fee is USD 1,000. This is non-refundable and will be automatically deducted from the program fee. Payment can be settled in Philippine peso are accepted. It is based on the prevalent exchange USD/PHP rate. You may request for rate assessment from AIM before making the payment. One-time payment is available, but the default option is a two-installment payment (50-50). Special installment schemes may be requested but will be subject to approval of the AIM Chief Finance Officer. Food, accommodations (e.g., dorm), and paraphernalia outside regular case materials will be for the account of the student. Study tour or innovation hot spot immersion exposes students to different investors and possible partners. It also provides students with an idea of the innovation ecosystem of another country and how industries work differently than their own. It is optional. I am not from Metro Manila, how can this work? Metro Manila is known for its traffic conditions so two options are available to AIM students. Students can rent a room/condo unit in Makati area. Students can apply for a room at the in-campus dorm. The campus has 24/7 security, a library, a nursery and is located opposite of a major commercial area with shops, restaurants and movies. Campus welcomes students from all AIM full-time programs (MBA, MsIB & MsDS) and all nationalities. "Innovation is more important than invention. Innovation implies industry."